India was the fourth largest motor vehicle /car manufacturer in the world in 2016. There are many exciting stories about different brands that have created a breakthrough in India, like the iconic Maruti 800, the table turner Hyundai Santro, the swift & agile Renault Duster and of course the current huge demand for luxury brands like BMW, Audi and Mercedes. Car manufacturers have always shown a significant interest in the vibrant car market of India. At a time in early 2000s when India was going gaga over Toyota Qualis, Mahindra & Mahindra launched a unique Made in India SUV and named it Scorpio. In 2002 Scorpio outsold all SUVs and MUVs that were on display in showrooms across the nation. For the uninitiated MUV is Multi Utility Vehicle & SUV is Sports Utility Vehicle. The few MUVs that we Indians were used to, were the Gypsy from Maruti Suzuki and Commander from M&M itself. But soon enough Gypsy ended being a Police vehicle while Commander got relegated to the rural areas especially in hill stations for off-roading jobs. Qualis was a very exciting product from Toyota which around the year 1997 had made a grand entry into the Indian vehicular market space in a tie-up with the Kirloskar group. Qualis soon enough with the boom in ITES industry became a part of office cab fleets, and people could not buy a car that was a ‘taxi’, and inevitably Toyota had to disband Qualis’ manufacturing in the long run. Scorpio was a macho SUV that burst into the Indian car space in 2002 with its rugged good looks, 2.6 litre turbo diesel engine and a pocket-friendly price tag of Rs. 5.5 lakhs (about 50,000 Rs. cheaper than Qualis). Scorpio since then has held its ground till it suffered a huge competition from the Innova (Toyota), Duster(Renault), & of late by Creta (Hyundai) and Brezza (Suzuki). Scorpio by now has sold a humungous 5,80,000 units across 15 years which include about 55,000 units sold abroad. Project Scorpio was conceived with investment of Rs. 500 crores, a huge amount in 2002. Accroding to Anand Mahindra, Chairman M&M, the company at the time was undergoing a business process reengineering with massive restructurings underway. The SUV Scorpio project had seemed like a huge gamble, especially with a 26 year old Design graduate from IIT, who was responsible for the now famous design of the 7-seater SUV. As a throwback the company attributes three reasons for the success of Scorpio; its design, its powertrain (100 HP engine) & its sub Rs.6 lakh pricing. 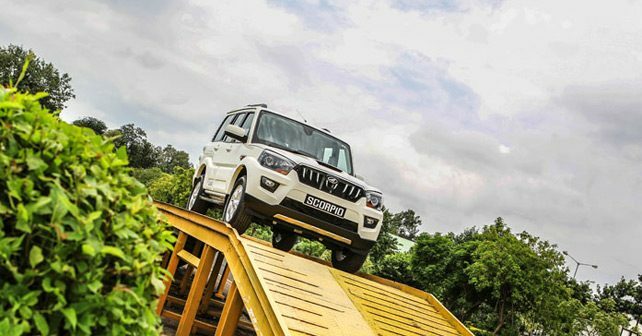 Company to this day believes that the Scorpio embodies Mahindra’s tough & rugged DNA, its styling, its off-roading capability & its reliability. While the product has undergone many changes in its design & its engineering, M&M’s another SUV named XUV, which has been performing really well in the SUV segment. The M&M has over the years shown some slowdown in its sales, but the fact is that between Scorpio, XUV & Bolero, the company has created a respectable space in the Indian SUV market. M&M is working on bettering its product, a product that has a huge nostalgia element with Indians. They might even have to do a complete model change if sales do not pick up. The biggest competitor interestingly is not from other SUVs but from car aggregator segments like Uber & Ola which is partially responsible for a drop in sales of cars in India over some time now. Well, let’s hope India’s truly Indian SUV with ruggedness in its DNA does not lose its space and die out!